Werner Molders was a very ambitious yet religious man. His religious beliefs had given him enough strength and courage to face any danger. Due to the early death of his father, his mother moved their family to Brandenburg so they could live with her parents. The family lived close to Chaplain Erich Klawitter who taught them with Catholic preachings. Molders was educated at the Saldria Gymnasuim where he excelled as a rower. After his graduation on 1931, he followed a military career and joined the II./2 Infantry Regiment. He was served with different infantry and pioneer units while he was with Reichswehr. As he continued working with them, his fascination with aviation became intense. Werner Molders was born on March 18, 1931 to a teacher by trade, Viktor Molders and Annemarie Riedel. He had two brothers and one sister, namely Viktor, Annemarie and Hans. He was married to Luise Baldauf nee Thurner, who was a widow of a friend who had died during active service. They were married in Falkenstein, Taunus on September 1941. They had a daughter, Verena. His airsickness during training did not hinder him in graduateing top of his class. 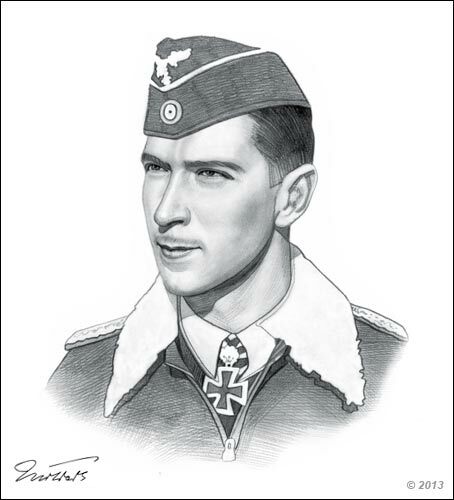 He worked hard with the team which is why he was promoted to oberleutnant on April 1936. He learned to refine his skill and used more advance tactics. During the Spanish Civil War, he earned his first kill making him the Legion’s top pilot. While he and his troops were in Spain, they were able to perfect the famous finger four formation which would improve their tactic and combat skills. He had also improved the cross-over turn so a Schwarm can easily change direction. He was assigned to the Western Front and continued to increase his number of victories. He was one of the few German pilots there who shot down a Hawker Hurricane. On June 5, he was taken prisoner and was not treated well by the French. Following the Fall of France, he was freed and was later on promoted to major. Being injured did not stop him from fighting. 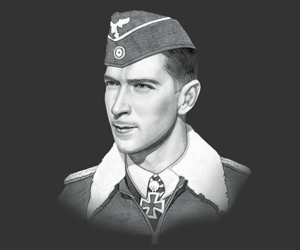 He was able to claim 40 victories and earned his second Knight Cross of the Iron Cross with Oak Leaves. On November 22, 1941, while he was a passenger in a Heinkel He 11 from Crimea to Germany, the aircraft crashed due to a thunderstorm. He was about to attend the funeral of his superior, Ernst Udet, who had committed a suicide. Molders, the flight engineer and the pilot were killed while Major Dr. Wenzel and Overfeldwebel Tenz survived the crash. According to the investigation, Molders would have survived if he had worn his seatbelt. A state funeral was given on November 28, 1941 in Berlin. His coffin was laid in the honor court of the Imperial Air Ministry. A few hours after his death, Jagdgeschwader 51 was named Molders to honor him. The members under him were given the chance to wear a Molders cuffband. His strong belief in Catholicism was also used to stir the Nazis regime's hold over Germany. The Modersbrief which was Molders letter written to the provost of Schwerin, expressed his strong belief in Catholicism. It stated that in the face of death, National Socialism will be able to look for courage and strength from the belief in Catholic preachings. This picture of Werner Moldersis Copyright © June 2014 Siteseen Ltd. We only allow this picture to be used for printed non-commercial purposes and particularly encourage it's use for printed educational non-commercial purposes. This Werner Molderspicture is not in the Public Domain. 3) Use of this Werner Molderspicture, or any of our pictures on websites re-distributing copyright free material is strictly prohibited.